Fahren Sie während dieses halbtägigen Abenteuers von Phillipsburg aus die beliebtesten Strände und Highlights von St. Maarten mit einem ATV durch. Zwischenstopps sind Airport Beach, Mullet Bay, Marigot und vieles mehr. Diese Tour ist hauptsächlich auf der Straße mit einem Teil im Gelände. Nach der Rückkehr in Great Bay, Philipsburg, können Sie ein erfrischendes Bad nehmen. Wasser in Flaschen und die Verwendung von ATV und Helm ist inbegriffen. This was a wonderful adventure. Our tour guide Dwight was friendly, helpful, knowledgeable and superseded our expectations for our excursion. Be advised though that this excursion does not include lunch. When coming off a cruise ship for any excursion we are careful not to take our bank/credit cards or more cash than we anticipate spending just in case our bags would get lost. For all-inclusive excursions this has never been an issue. After purchasing beverages at a few of our excursion stops and giving our guide a generous tip we assumed lunch would be served at our return. It was not. Thinking I had possibly misunderstood as no one else mentioned lunch we returned to the van taking us back to port as we needed to return to the ship to get money for food. It was only on the way back that others started also mentioning the included lunch. Not sure if they forgot to feed us or we just didn't look hungry. There was definitely plenty of free rum juice, just no food. Our excursion date was September 18, 2018. Maybe they use to include lunch as other reviewers commented on how good it was however the description should be changed if no longer included. Again great adventure but pack a snack. 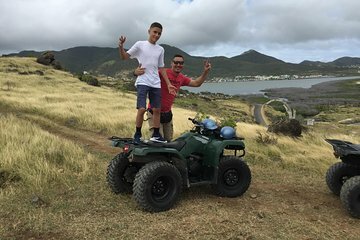 Our family of 4 had a Wonderful time on this ATV adventure in St. Maarten. It was easy to locate the gathering spot at port as we hopped off our Disney Cruise. We were shuttled to the Dive shop and escorted to our ATVs. Our tour guide did a fabulous job leading us around the entire island with wonderful pit stops in scenic areas for pictures and a swim. Our 2 boys said it was a highlight of our trip. We would highly recommend the experience and give our tour guide 2 thumbs up for the ride. Really was awesome! More like a 5 hour tour. Junior was our guide and was excellent. Took us all over the island. Went to the airport beach and got to see a 747 land right over our heads. Swam at a gorgeous beach with sand like silk. Stopped at various lookouts for pictures. And best of all included a nice lunch on the beach. So much fun for a small amount of money. Well worth the price and a must do! My husband and I took this ATV tour during our time in St. Maarten for our honeymoon. It was a great way to see the island at our own pace. Our tour guide was great...eager to answer any of our questions and sure to give us time for pictures at all the must sees on the island. He worked with our interests and schedule to tailor an experience based on our preferences. We were the only couple that participated in the tour that day, which we loved! Lunch was delicious and the beach we stopped at was amazing. We highly recommend this tour and will more than likely do it again should we make another trip back to St. Maarten. Our ATV tour was great. We saw the whole island. Our guide Julio was very safety conscious. The total trip is on the main road. No off road driving that I thought may happen. Our stop at Maho beach was not much as the larger planes only came in later in the day. The Atv's ran well and we had a fun day. Tons of fun seeing the island on ATV. Our guide could have been more informative but he didn't really speak English so there was a language barrier. He was pleasant however. Important to know that you ride on the main roads with all the traffic rather than on ATV trails and you are expected to go fast enough to keep up with traffic. If you don't like to go fast or are nervous this may be intimidating. You get to see some great sites and the price is right because you're on the ATV a good part of the day and a hearty lunch and soda are included. This was a great tour which helped us become familiar with the whole island! Unfortunately, we didn't do any off-roading but we definitely got to see a lot and we had a lot of fun! We stopped for lunch at Orient Beach and the food was amazing! Our guide was extremely knowledgeable about the island and he made it a great day for our group. The place was sketchy with old equipment that should have been in the junkyard. The guide took us to four stops but didn't tell us anything that I would consider a guided tour, it was a follow me to the next stop. It was fun riding but with better equipment and a more friendly guide it could have been better. The Adventure was great, we had a guide to just our family. he was great, the Quad were in great shape.